2 Wives 2 Mums: Date night at Cirque Du Soleil! Date night at Cirque Du Soleil! On Thursday evening we were lucky enough to be invited along to see Cirque Du Soleil at the Genting Arena in our home town of Birmingham. We were so excited for various reasons! Firstly, it meant we would get a baby free date night - our third one in 9 months! Although being mums is amazing, it's fun to be able to dress up, put makeup and jewellery on, and go out for a grown up evening where we concentrate on just each other! Secondly, it meant something to look forward to in the middle of the week, and last but definitely not least, another chance to see a Cirque show. 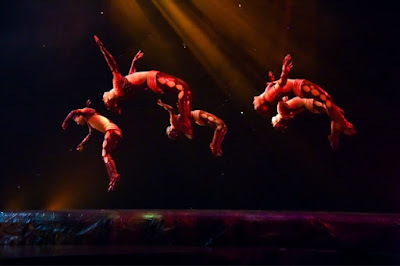 The first time we saw Cirque Du Soleil was the Zarkana show at the Aria in Las Vegas, which we absolutely loved, so we were interested to see how it would compare. Oskar safely left in the hands of his grandparents, we set off for The Genting Arena. We hadn't been here since the addition of the new Resorts World complex, so headed here first for food, as they have plenty of veggie and vegan options from GBK, Las Iguanas and Pizza Express. We parked at Resorts World and were worried about finding our way to the arena after dinner, but, helped by the staff, we found that it was literally across the road. We settled into our seats, and the show began! 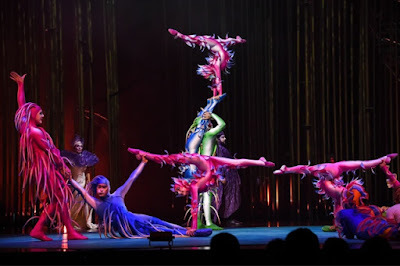 The Cirque Du Soleil shows are all slightly differently themed, and this one was Varekai - Tales of The Forest. 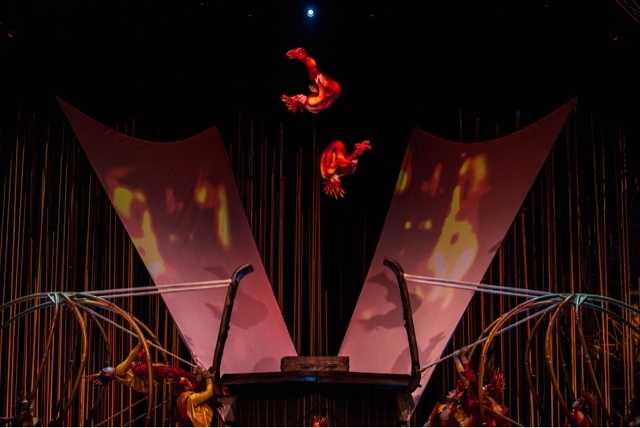 Opening in 2002, Varekai (meaning 'wherever' in Romani) promises to be 'an acrobatic tribute to the nomadic soul'. As soon as the main act began we were immersed, and reminded of how magical Cirque felt when we had seen it in Vegas. The music is beautiful and so atmospheric- it's more impressive when you realise it is all live, performed by two singers, and seven musicians, who are often just visible to the audience. The story begins with Icarus falling from the sky - wires were used so the acrobat fell in slow motion, which was beautiful. From there, Icarus lands in a lush forest of exotic creatures, gaining his strength, and finally falling in love. 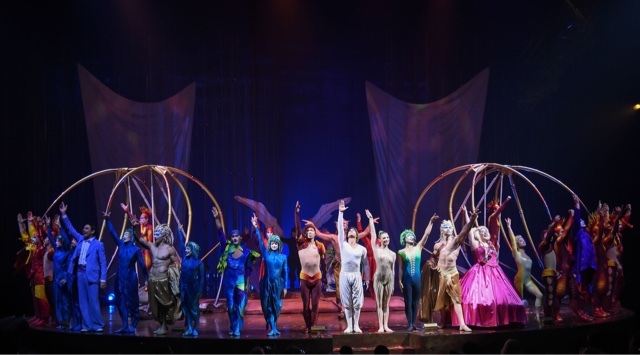 The show is made up of various acrobatic acts telling the story, and as with all Cirque shows, there are a few of their comedic acts thrown in, with lots of audience participation! We have to say, these aren't our favourite part of the show as the slapstick humour isn't really our thing, but they do break up the show meaning that the acrobatic acts seems all the more impressive when they return. One of the things that really struck us about the show, was the incredible use of the space. Aswell as the main rectangular stage, there was a circular section to the front of it,which the acrobats really do make the most of, giving the impression that the show is overflowing from the stage. 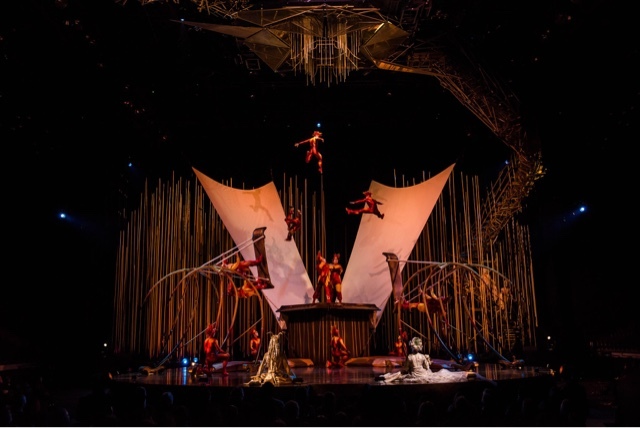 The set stretches up into the ceiling, trapeze artists soar out into the audience, acrobats drop from the heights of the roof down to below the stage floor, flowing fabric from costumes flies in the breeze, and strange lit orbs float out into the stalls. It really does give an other worldly, additional dimension to the show, and is extremely immersing. The use of props in Cirque is something the shows are known for, but we found the way props were used in Varekai to be particularly amazing - in a synchronised tumbling act, an acrobat is seemingly about to crash to the floor only to bounce from it like rubber due to a concealed inflatable floor, blue fabric acting as water disappears down a 'plug hole' in the stage and in a Russian swing act, acrobats fly across the stage and seem about to fly into a wall before being caught in fabric panels. Like many people in our age group, it takes a lot to leave us awestruck, but Varekai definitely achieved that. Many acts drew audible gasps of wonder, tension, surprise or disbelief from the enthralled crowd, in particular the Russian Swing finale, with six acrobats joining two swings, propelling them high into the air and across the stage, with the audience (definitely including us!) on the edge of their seats as the acrobats landed in sheets of draped fabric. But aside from the stage, sets, music, and scenery, by far the most impressive aspect of Cirque Du Soleil, is undoubtedly, the performers. Thanks to the stunning costumes and their incredible, fearless talent, you'd be forgiven for thinking they were super human, and forgetting they are mere mortals in character. The flawless performances seem effortless, but we are sure they are anything but! All too soon, the show was over, and we were returned to reality - the whole two hours is pure, other worldly escapism. You will remember certain amazing performances, but in general, the whole show will pass you by in a dream like cloud of magic. If you've never seen a Cirque show, we can't recommend booking tickets enough! We had lower expectations for the show being in Birmingham than when we saw Zarkana in Vegas, but those expectations were met and exceeded. A huge thank you to LD Communications for inviting us on a perfect date night, and the crew and performers of Cirque Du Soleil Varekai for reminding us of the magic of Cirque, and for such an amazing night - you had us, and the rest of the packed arena, enthralled from start to finish. 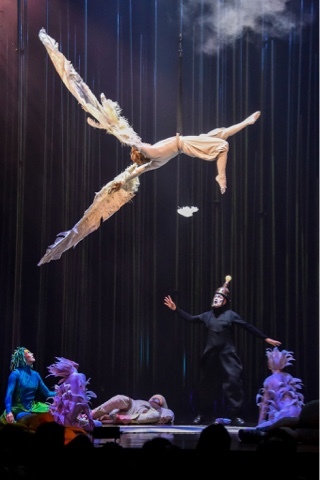 Varekai is in Nottingham 8-12th March and Glasgow 15th - 18th March, with tickets at around £55 per person, before visiting Denmark, France, Amsterdam, Slovakia, Romania, Hungary, Prague, Bulgaria, Slovenia, Lithuania, Norway, Finland, and Sweden!